Have a Miami Marlins fan in your life? 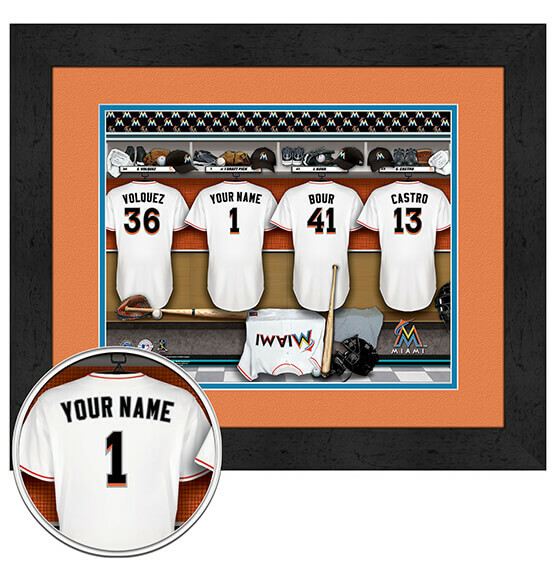 Give them the gift of a lifetime with this Personalized Locker Room Custom Framed Wall Art. Simply tell us the 12 characters or less you want to include in this epic locker room scene that will include the friend or family member's name of your choice. It features a digital double mat design with the Fightin' Fish's team colors, a lacquered black frame and high-quality print and glass for a piece that will be cherished forever. It comes ready to hang with an easy-to-hang sawtooth back for simple mounting.